Security Ratings, the Way They Ought to Be. combining the outside-in with the inside-out. What Would a Hacker Do? Panorays’ outside-in ratings are based on a simulated reconnaissance stage that a hacker would perform as the initial step to penetrate your organization. Panorays also provides an inside-out rating based on your internal company policies and regulatory policies, such as GDPR and NYDFS. Ratings consider the business and technology relationship with your suppliers, giving more weight to those with access to sensitive data. Panorays provides you and your suppliers with a checklist of cyber gaps, along with how-to instructions for remediation. No more false positives. Your suppliers can dispute or validate findings, receive instructions on how to mitigate cyber gaps, and report progress—all on the same platform. 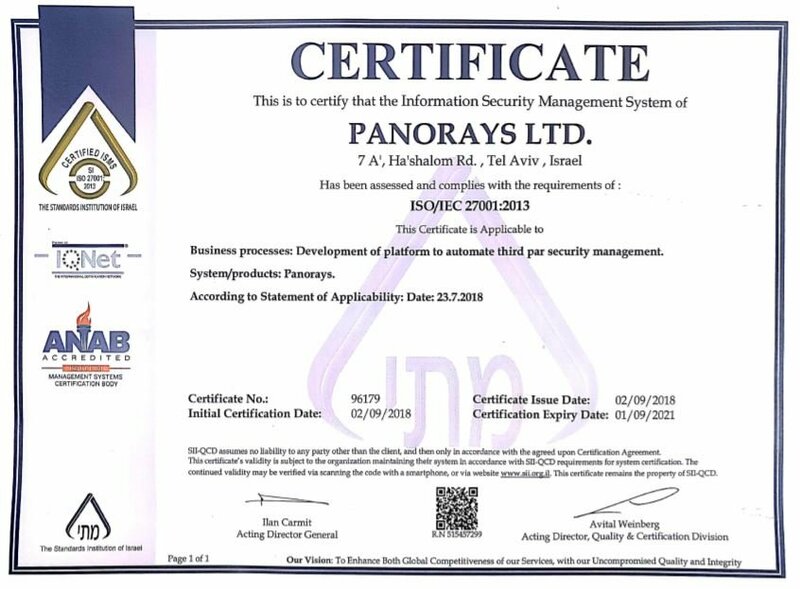 Panorays monitors your suppliers’ cyber posture and sends you live alerts of any changes in security. You receive notification when suppliers fix their cyber gaps or when something new must be updated.